So I'm ridiculous when it comes to what makes me decide to watch something. I was aware American Horror Story was probably going to be my jam, but I kept putting it off. Even when they did a season set near me, covering a major historical weirdness I've grown up hearing about, I still kind of shrugged it off. It took one of the creators shrug-confirming an old theory about the series being based on Dante's Inferno to make me crack it open. And yeah, the first season was as good as everyone said. If not better. I'm going to watch through all that's out now -- which I was going to do anyway -- and do my own running analysis. But here's the thing. I'm coming in with theories. Theory 1: The nine seasons will correspond to the Nine Circles of Hell in descending order, regardless of what may initially seem to be the most prevalent trait of the season. Theory 2: The character(s) who most exemplify the assumed trait of the seasons will be the one(s) we need to keep our eyes on, and isolating those characters will help us start to see the overarching connections of the anthology. Theory 3: There will always be a Virgil character, and there may or may not be a Dante character (most likely Dante will be the viewer). Theory 4: If Theory 1 proves to be obviously untrue, then it may be a sign that the viewing order and the storytelling order (like Chronicles of Narnia and The Melancholy of Haruhi Suzumiya) are different, and we won't know why until the end. Seem a bit much for a horror anthology show? Good. That's what I do. I'm from William & Mary. Now, there are a couple things to remember about the Circles of Hell as Dante describes them. People largely remember the types of souls in each Circle, and what specifically they are devoted to. But there's another aspect: the punishment. As I've only finished the first season (and the first Circle doesn't include any sort of punishment), I've yet to see if that will figure in. But it may be something to keep an eye on. The other thing to remember is that every place Dante went had nine circles... this includes Purgatory and Heaven. I think it might be worthwhile to cast an eye toward those for context, especially Purgatory. And finally... if none of this was intentional on the part of the writers, it doesn't matter an awful lot. I'm probably layering much more meaning on than was ever intended. And that's okay. Unintentional meaning is still meaning, and it's also hella fun. So. Let's get to it. Also, goes without saying that spoilers like crazy. 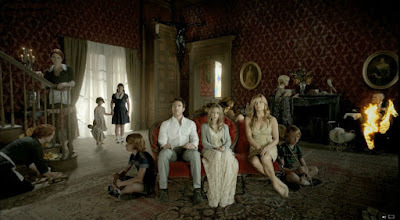 A lot of analyses I stumbled across paired Murder House with the second circle, Lust. And, well, it's hard to argue with that. The majority of the hells of this season happen because of lust and infidelity. A broken marriage kicks off the move. The previous owners also struggled with infidelity. The keeper of the house is Moira, a ghost who presents differently to men guided by their desire rather than their logic. And the rubber suit in the attic becomes the uniform for the doing of bad deeds. But it's fair to say that all the circles present somehow. Anger and violence are constant -- ghosts kill each other for fun, and the Harmons themselves eventually join the pack (albeit for the safety of potential future tenants). Heresy is everywhere, with the belief that Tate and Vivien's son will be the Antichrist. To keep to the descent, the Murder House has to be Limbo... and fortunately, that's what fits best. The setting of the season directly corresponds to the first circle, both in the modern sense of the word and by Dante's definition. In Inferno, the concept of Limbo is virtuous but "unsaved" people: those who can't go to Heaven on a technicality, but still deserve a nice afterlife. But we use the word in common parlance for a "place between," being unable to move on, independent of morality. Both are actually at work here, it seems. The Murder House's ever-growing collection of ghosts absolutely exemplifies the second: if you die there, you're stuck there, regardless of whether you're good or bad or not really either. Kind people doing their best are stuck there just as readily as mass murderers. So within the zeitgeist, it makes sense. But Dante's definition still stands. 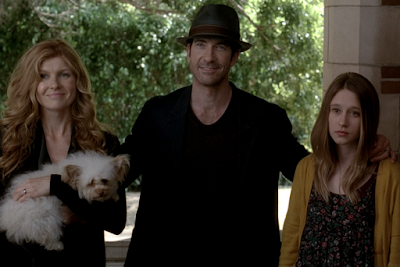 The Harmons, a broken family by anyone's definition, finally find happiness in the Murder House. They gain the ability to banish their demons (quite literally, as we see Tate and Hayden watching the family's happy Christmas in a dark corner), and despite the fact that they can never pass on, they have a sort of "Heaven lite" they are able to construct for themselves. And the Harmons, despite all their drama, were not bad people. Misguided, dysfunctional, and perhaps not quite good enough for Heaven what with adultery and stabbing and stuff. But they aren't people who don't deserve happiness. Additionally (and dipping back into my Catholic school education), Limbo is a place for another demographic: babies who died without being baptized. There's a heavy focus on babies all through the series... Vivien's miscarriage, Nora's need for a baby. And in the end we have Jeffrey, who drew one breath before passing on, joining his family in the house for eternity. As Vivien and Ben chalk up the strangeness of the Murder House to insanity and hormones and elaborate pranks, Violet is immersed in its ways very quickly -- and it's Tate, even before her suicide, who begins guiding her through it. As with Virgil, Tate is a resident of the Limbo through which he's conducting his tour. Whether this makes Violet his Dante, I'm not entirely sure. But I'm prone to say no. He doesn't show her everything, after all, and her tour is conducted largely as a new permanent resident of the Murder House. 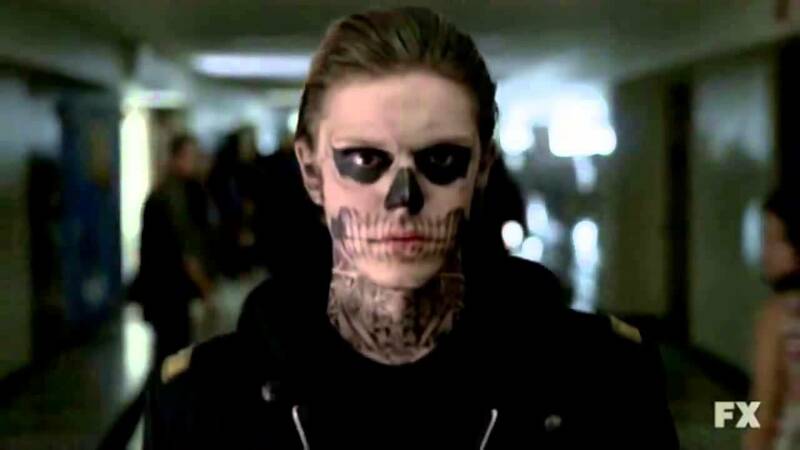 However, Tate does (unknowingly) introduce us to most of what we know about the setting. Much of what we learn and experience with regards to the other residents is via Tate's first meetings with them: whether he helped or killed them, and what he did in their names. His lack of awareness of us, and the fact that a dead high school shooter seems like the last person you'd pick as an audience association character, doesn't change that fact. We learn mostly via him. I am aware that, while AHS has a stable of actors, Evan Peters is the most stable of that stable, appearing in every season so far. It makes me want to cast his string of characters as our permanent Virgil... but I'll need to see a bit more before I make a jump like that. 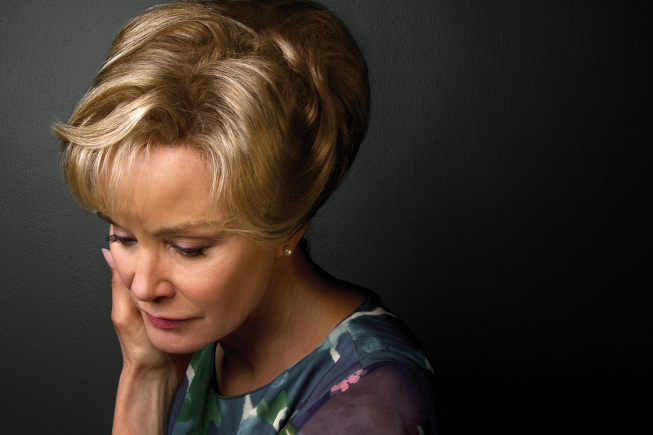 A point that might be easy to miss amidst the ever-growing cast of ghosts is the one major character who doesn't die: Constance Langdon, the Virginia sweetheart who was going to become a movie star and ended up being Mee-Maw to the Antichrist. As we watch the series, Constance seems to be pulling the strings more than anyone. She pulls triggers, steals babies, and smokes cigarettes casually over dead bodies like it's her job. She seems to be, by all accounts, the ringleader. But I'm convinced -- completely convinced -- that this is Constance's story. And she's the character trapped in Limbo. The ghosts have a nice, handy, literal Limbo they can't escape. It's not their fault. So they put up a Christmas tree and make the best of it. Constance could leave at any time. When the series opened she had one daughter (Adelaide, perhaps the only true innocent in the whole main cast and the one permitted to pass on). She could have upped sticks and left. She could have taken her one remaining child away to a quiet place. Unlike the Langdons and the Montgomerys and everyone else next door, she has no excuse. But she stays. Because she wants her children. Because she wants to control Moira. Because she, overall, wants power. And it's fascinating that the Langdons -- the ones with the least power to change their situation -- end the series freer and happier than Constance. Perhaps it's her Limbo we're meant to see: one she's placed herself in. Finally... just to really stretch and strain my theory... I want to see if there's any point in checking out the first circles of Purgatory and Heaven as well. In Dante's Purgatorio, Virgil begins Dante's journey at the base of a mountain. Here are those who died too stubborn to obey the laws of God, and they will remain their thirty times longer than their stubbornness. Is there a tie? Mmmmmaybe. Not as clear and clean and pretty as the Inferno one. Ben's stubbornness was the most prominent, as exhibited by how long it took him to see the "real" Moira. But rather than being too stubborn to align with God's laws, it was a willingness to align with his wife and her needs. We see his slow change, his willingness to say "no" when necessary, but it takes him until the literal end of the show to accept that his wife is both sane and in pain. That's a bit of an English major stretch, though. It's fun, but it's not enough to convince me that it's intentional or useful. Let's try the First Sphere of Heaven: The Moon. This Sphere is a bit like the first circle of Hell -- we have people who aren't quite okay enough to go to Heaven. Specifically, we have those who were unfaithful through no fault of their own. And here we go: we have a match with Vivien and the "Rubber Man" (revealed to be Tate). For completion's sake we could also throw in Hayden stalking Dan from beyond the grave, I suppose. But this version of infidelity being "punished" is far closer to the meaning of the season than comparing it to the Second Circle of Hell would be. One season in, and we can align both the First Circle of Hell and the First Sphere of Heaven with the plot elements. We also have a set of characters who experience it literally, as well as one whose metaphorical experience of it seems to be far more punishing. And we have a Virgil. Just not a very happy one. I'll be carrying on with Asylum next, and that's a difficult one. My theory states that it should align with Lust, but most online want to pair it with Anger. Maybe my theory will break in a few days. We shall see.